My #TBT recipe post is back! I hope you all are as excited as I am. The recipe I am sharing today used to be made by my grandma and my mom when I was little. 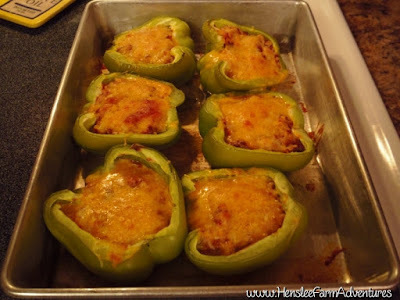 My mom always loved it, but to be honest, I really never cared for stuffed bell peppers. I just didn't like the cooked peppers. Also the filling had rice in it and as a kid I didn't care for rice either. So you might be asking yourself why am I sharing a recipe that I didn't like growing up? Well because my tastes have changed and a couple of years ago, I came up with my own recipe for stuffed peppers that I loved. In fact even the kids loved it! What I did different is halved the peppers and laid the halves cut side up and stuffed them that way. I liked that because there wasn't as much pepper to eat. I also omitted the rice and instead used some black beans and corn along with hamburger meat that I flavored with my taco seasoning blend and then added a little salsa. I topped that with cheese. It was wonderful! Even though I love that recipe, it is not the one I am going to share with you today. These stuffed peppers were actually made out of leftovers and more closely resemble my grandma's recipe that she used. 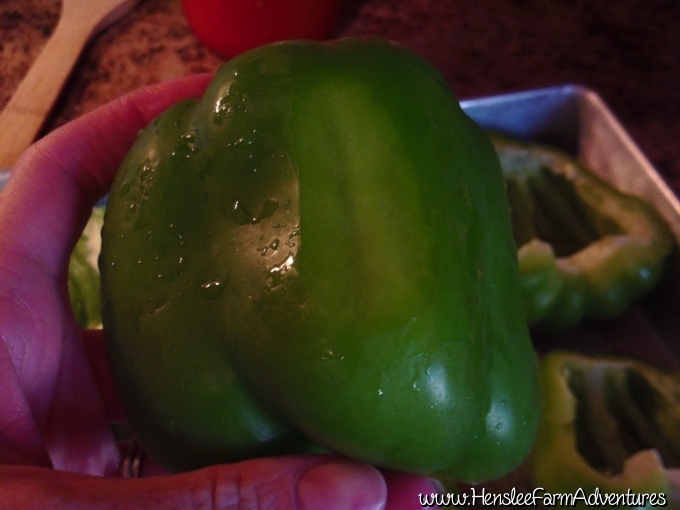 HINT: Once the peppers are assembled they can be frozen for later. So now on to the recipe. Actually there really is no recipe for it. I could have sworn that I had a written recipe for my grandma's peppers, but when I went to look for it I couldn't find it. I do know that she would stuff them with browned hamburger, cooked rice, and homemade tomato juice. Then she would cook them until the peppers were done. So I based my recipe on that. My ingredients...so glad I could make over my leftovers! Here are my ingredients. I had some leftover meatloaf that wasn't enough to feed all of us, but it was perfect for this dish. 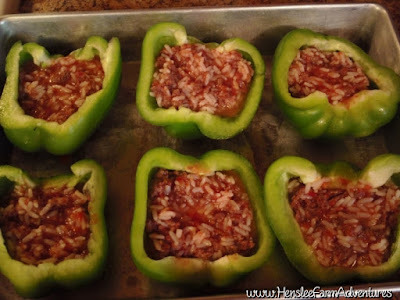 Plus I thought the way the meatloaf was flavored would give the peppers a great taste. I also had tomato juice left over. This of course is my family's homemade version. It is better than any tomato juice you can buy! If you don't have tomato juice on hand, you can always use tomato sauce, or even marinara sauce would be yummy. I used a 1/2 cup of dry rice and three sad looking big peppers that I knew needed to be used very soon. I started by preparing my peppers. I cut them in half long-ways and removed the seeds and membrane. I put them in a greased pan. Here is where I shaved off a piece on the backside so it would be stable. Some of the peppers didn't want to "sit" very well, so I sliced off just a little of the underneath side so that they would be stable and wouldn't slide around or tip over. As I was preparing the peppers, I had already started cooking the rice. After the peppers were ready and before the rice was done, I chopped the leftover meatloaf into a bowl. Once the rice was done, I added it to the meat and then poured in some tomato juice, and mixed well. You can see the consistency below. I didn't want it too soupy, but moist enough so that when it baked, it wouldn't dry out. Stuffed and ready to bake! I then put this mixture into each of the peppers. I just spooned it in and made sure not to fill it too full. Once they were all full, I put the peppers into a 375°F preheated oven for 20 minutes. After about 20 minutes, I removed the peppers and put a generous helping of grated cheese on top of each one. Then I put them back in the oven and let them cook for another 10 minutes. Depending on the size of the peppers and also how done you like them you may need to cook them a little longer. I do not like the peppers mushy. Thirty minutes was perfect for me. These were even better than I thought! The family loved these! They were super easy to make AND I was able to use up leftovers which is always a plus in my book. These lasted us two meals (supper and lunch the next day) which is also a big plus. 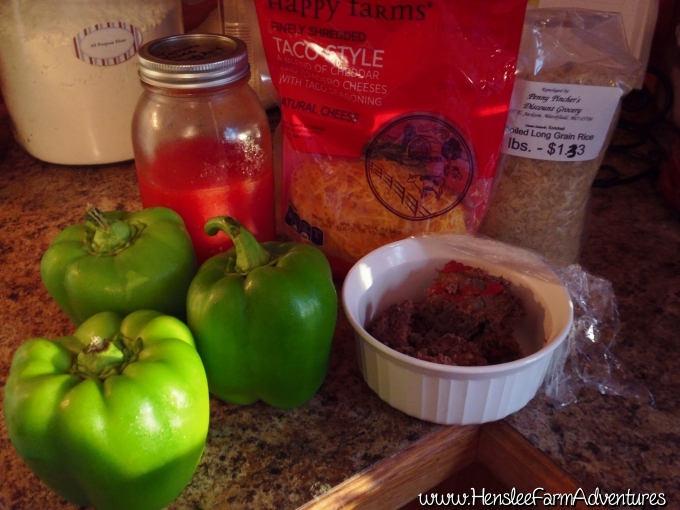 Besides using leftover meatloaf like I did, leftover taco meat would be great as would leftover sloppy joe meat. You could also add in a few veggies like I did in my original version (the mexican one) to suite your tastes or to use up any leftover ones you may have. No matter what you do, these are sure to be yummy! So let me know in the comments, have you had stuffed peppers and if so how did you make them?